I had a surprise walking buddy join me today. I mentioned that I would like to go on a walk today and my daughter (5) suddenly appeared with her backpack on saying she was ready! 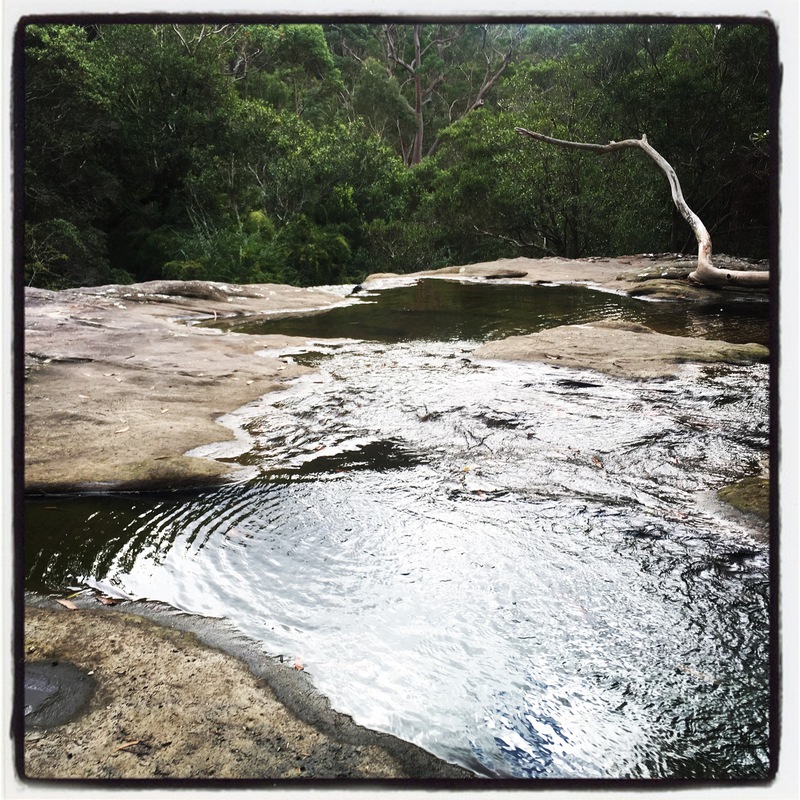 Well the 30 days to overnight hiking challenge, run by Caro Ryan of blog lotsafreshair, required one to do a number of training walks each week – I wasn’t sure how much of a workout I would be getting with a five year old in tow but I’d give it a shot! 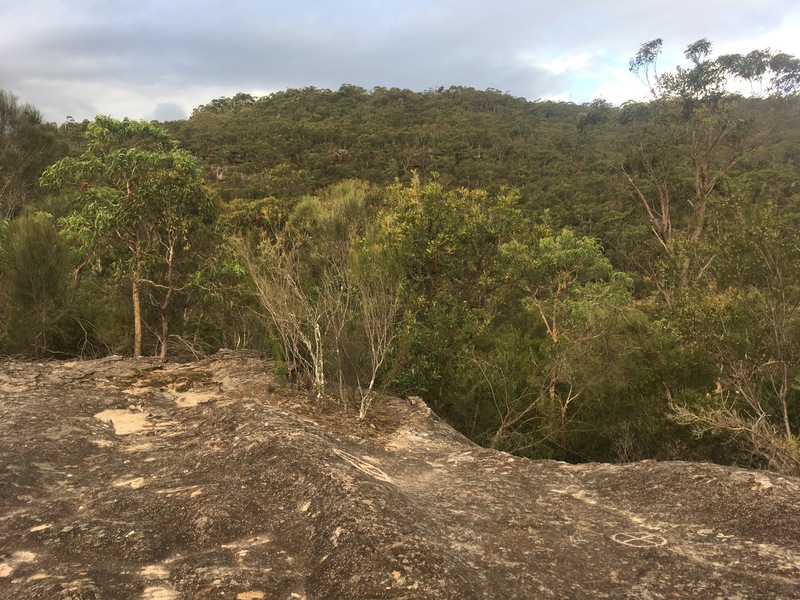 I drove to the entrance of Warrina Street firetrail, Berowra and we started our walk heading downhill along a wide trail. 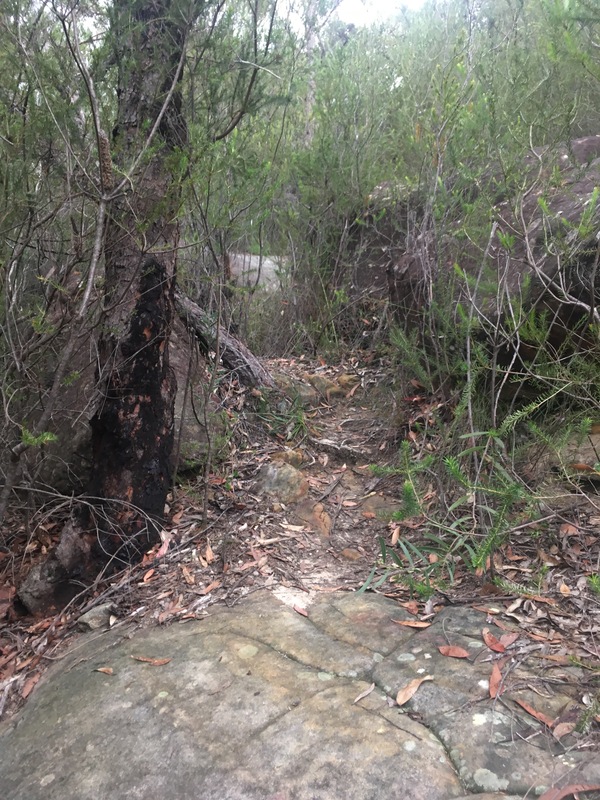 I had walked this section before whilst doing the geocache called “Tippers time trail”, an awesome little adventure that hid caches inside an abandoned car in an impossible to drive to place, inside tree cavities, and hanging on a rope inside a tree hollow a meter overhead, and other interesting places. The trail was covered in water from the recent rains and some puddles had tadpoles swimming about, which delighted my daughter. Further on were some wide rock platforms with established vegetation islands, which become the subject of scrutiny by my daughters magnifying glass. Two large dogs passed us, barking loudly but no owner in sight. They had collars but also looked unkept. Bit scary but they were not going I’m out direction so all was well. The trail ended at a large electricity pylon but there was a small track that carried on downwards to the left. The track became very rough, part bush bash, and was very rocky. We were being extremely cautious regarding snakes as I had seen one the prior day, so when the grass to the sides of us became thick we stamped our feet to alert any slithery friends to our presence. We pushed on down until the sounds of distant traffic hushed and the trickle of running water took over. 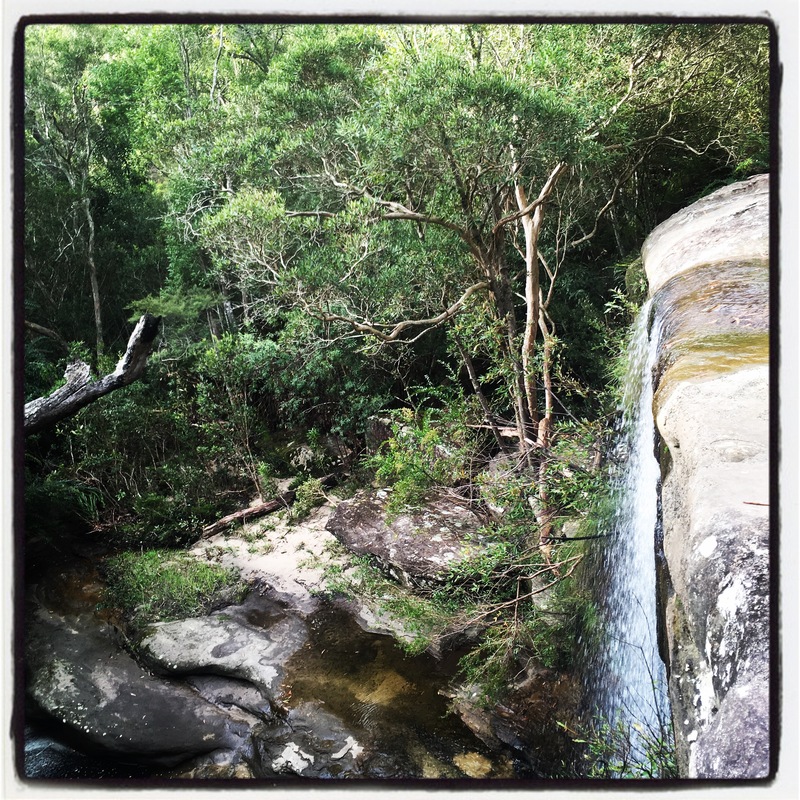 After climbing down some rocky bits we finally found ourselves at the waterfall. It was beautiful! 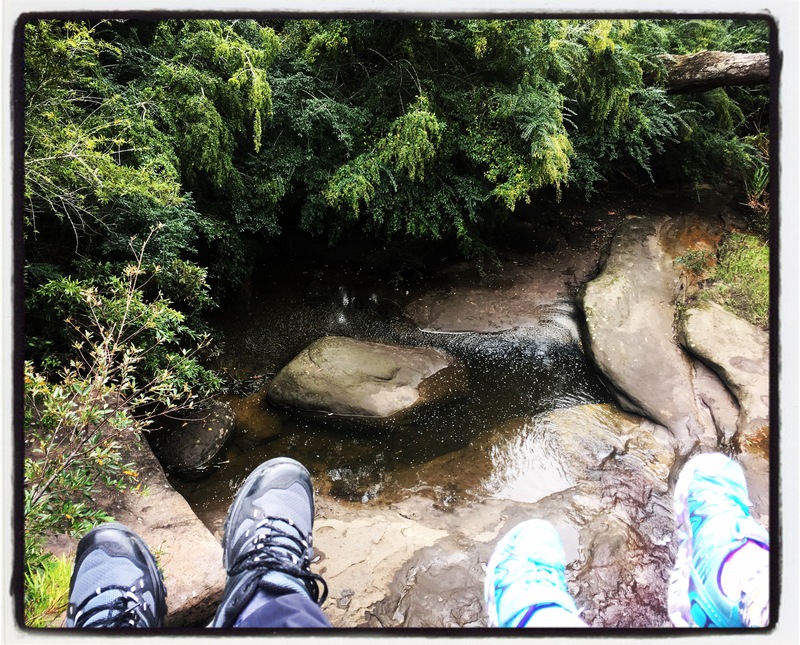 We sat with our feet over the edge and chatted about what we could see. We then explored the river and had leaf races. We found more tadpoles and some tiny green spiders (who became riders of our leaf boats..). I think having my daughter with me allowed me to enjoy the place in a way I could not have if I was on my own and I was glad she was with me. I was worried about the climb out (about 100m) but she handled it with no issues. Her magnifying glass broke up the ascent for her as we looked at mosses and flower and leaves along the way. No sign of the dogs though we did hear a couple of barks in the distance. All too soon the walk was over and we were driving home. We had a lovely afternoon and both of us got in some exercise! The waterfall. We raced leaves over the edge! This is the about the pleasures of the unexpected. I think your daughter will remember this hike with fondness in the years to come. A beautiful father daughter day together. I just love that she wanted to do it. It was non negotiable! “I’m ready daddy” – how could I say no! What an excellent post, Nathan! I’m so pleased you both enjoyed your hike. She’s asked to go on another one today! Winning!